If feels a little ridiculous to write a "no I'm not dead" post for a blog without followers... But the active 2008 blogger in me is really uncomfortable with this lapse. And who knows - maybe I do have a few followers who have been worrying about my well being. SO I just wanted to post a quick update that right now, I'm a little busy with a project that's taking up all of my free time. 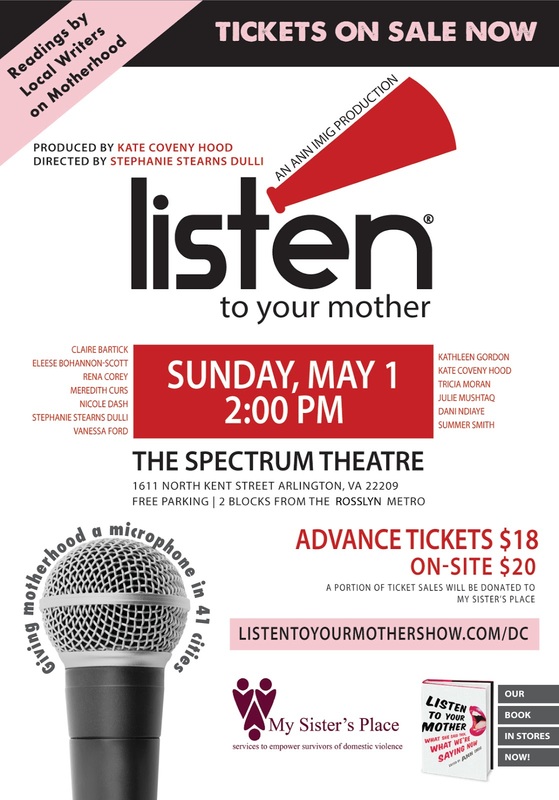 Every year, I work on a local production of a national stage show, Listen to Your Mother DC. LTYM features local writers and storytellers reading original essays on the subject of motherhood. Hilarious...heartbreaking...heartwarming...though provoking...All of that and more! If you live in a city that hosts an LTYM show (check HERE to see all 41 cities in 2016), buy a ticket! Especially if you live in MY city. On the fence or just have NO idea what this is about? You can watch the show videos online. Here is our 2015 production. Grab some tissues...for both tears AND laughter. At some point I will be back to tell some stories about our activities around DC over Spring Break and our weekend trip to Philadelphia over Easter...and oh yeah - that road trip we're doing in just a few short months! As always - keep your comments and e-mails with advice, suggestions and links coming!